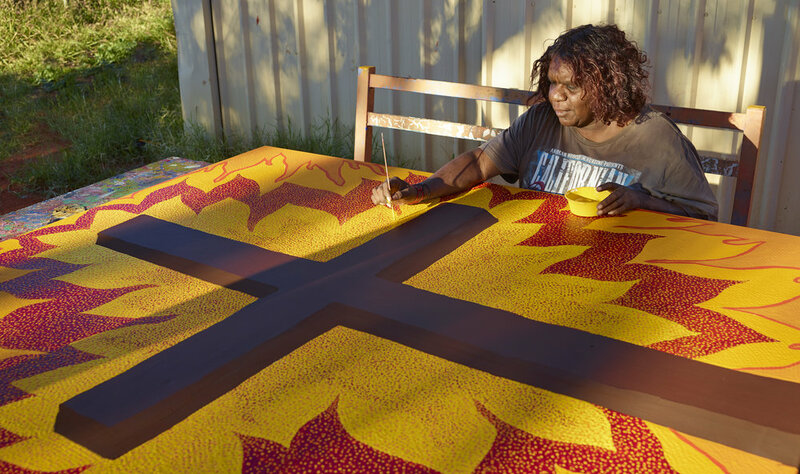 Many local people are keen artists and a number have expressed their support for the cross project in art. The picture below is of Alison Multa and her representation of the cross. This picture was purchased by Mission Australia a major not for profit who have supported the work in Haasts Bluff and the cross project. The picture is now located in their offices in Sydney. You can own your own copy of this artwork by visiting our online shop. Proceeds from sale go towards our work. Alison is a local Elder and Traditional Owner of the land at Haasts Bluff. This picture is her visual artistic representation of the cross.